If you're looking for a body to frame mount that lasts longer and won't degrade, Prothane's polyurethane body mounts are a great "Made in the USA" aftermarket alternative to OE (Original Equipment) rubber mounts. ...factory rubber bushings or something more durable? Whether you're putting your 4x4 through a lot of rough trails, or just putting a ton of miles on your daily driver, your body mounts are absorbing a lot of punishment. If the original body mounts on your vehicle are worn or degraded then your body and frame might be misaligned causing problems like your door or hood not latching when you close them, or a visual sag on one side of the body of your vehicle. When you have these symptoms of worn body mounts it's time to get them replaced, but should you go with the factory rubber bushings or something more durable? 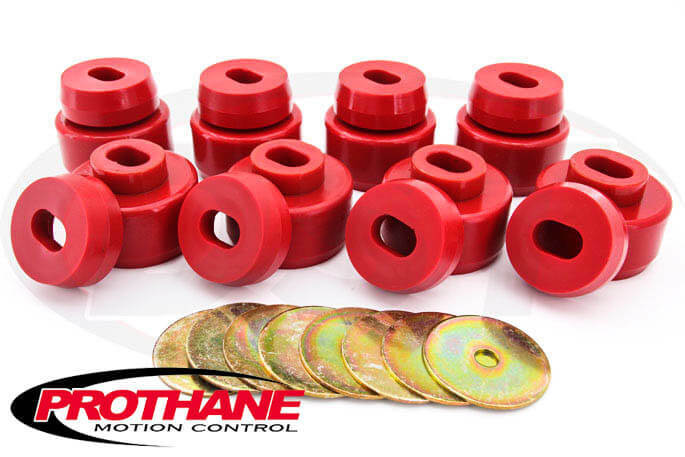 Prothane's special formula polyurethane bushings balance the "give" that you want for a comfortable ride, with longevity that rubber can't begin to compare with. 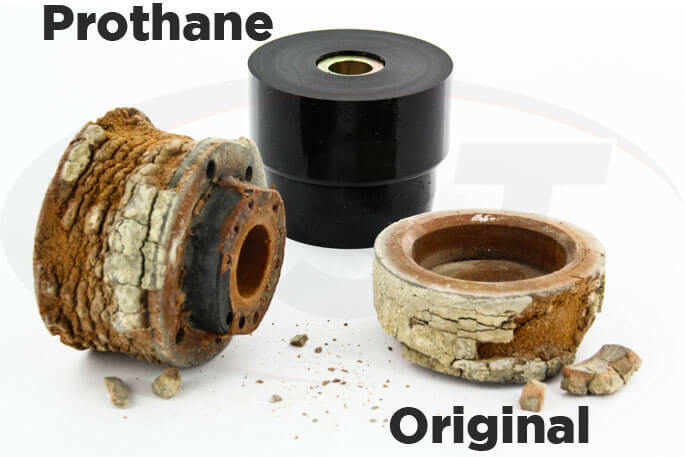 If you want to keep the body of your vehicle from sagging on the frame ever again, or fix that sticky door or hood, then Prothane's body mounts will be with you for life. The original body mounts on your vehicle are probably made of rubber and do a great job of absorbing vibration from the road, but they don't handle wear and tear very well. Engine fluids, weather, and other elements can also cause those bushings to degrade to the point that they can begin falling apart. If you're restoring a vehicle that's seen better days then you might be able to pull the old body mounts right off with very little effort. Polyurethane is a much more durable material that still maintains some flexibility, but you will probably notice a little more vibration than with rubber mounts. The up-side is you have a part that restores and holds body to frame alignment, provides a comfortable ride, and is warrantied to last the life of your vehicle.